In March 1997, the dry dock SOOSAN was dry transported from Taranto, Italy to Nantong, China by the heavy-lift ship MIGHTY SERVANT 3. Because of the dimensions of the dock, it was overhanging the ship's stern as well as its sides. 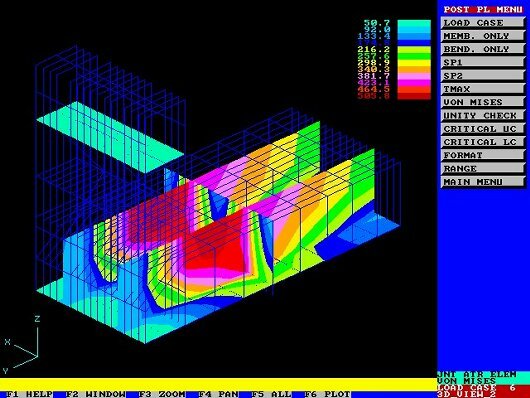 In order to ensure transport feasibility, a structural analysis of a typical section of the dry dock was performed. A detailed StruCAD*3D model containing 1,150 beam and 720 plate elements was built to analyze the behavior of the structure when subjected to dynamic loadings during the transport. The FEM analysis showed that the beam and plate stresses were within the allowable limits. The output plot above shows the von Mises stress contours in the plate elements. Check dock frame capabilities with respect to cribbing loads.